Our electromechanical and hydraulic system solutions are built in Rexroth quality which means proven reliability and safety for your machines and employees. 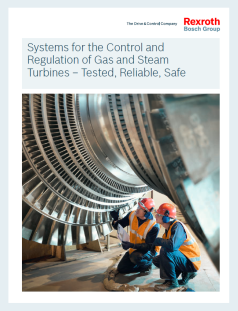 Gas and steam turbines form the main components of conventional power generation plants and ensure the stability of supply networks in conjunction with facilities that produce renewable energy. To counteract the trend towards higher energy costs, more research is being conducted to develop functional-safe electromechanical and hydraulic solutions for power generation plants. The aim is to ultimately improve availability.